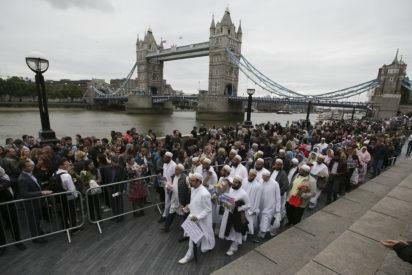 Members of the Dawoodi Bohra Muslim community (in white) join others as they bow their heads during a vigil at Potters Fields Park in London on June 5, 2017 to commemorate the victims of the terror attack on London Bridge and at Borough Market that killed seven people on June 3. “The cabinet of ministers decided on tough measures, including a 10-day nationwide state of emergency,” Minister of City Planning Rauff Hakeem said as police imposed a curfew in the riot-hit central district of Kandy. Hakeem said the riots were concentrated in Kandy — home to famous tea plantations and Buddhist relics — but the government wanted to send a strong message given outbreaks of communal violence elsewhere recently. The Sinhalese are a mainly Buddhist ethnic group making up nearly three-quarters of Sri Lanka’s 21 million people. Muslims account for 10 percent of its population. The post Sri Lanka declares emergency to quell anti-Muslim riots appeared first on Vanguard News.